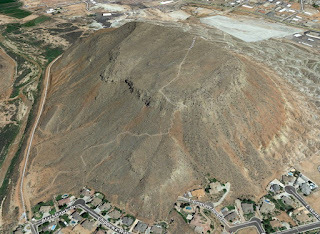 Another airmail navigation arrow sits atop a slanted mesa named Shinob Kibe in Washington, Utah. 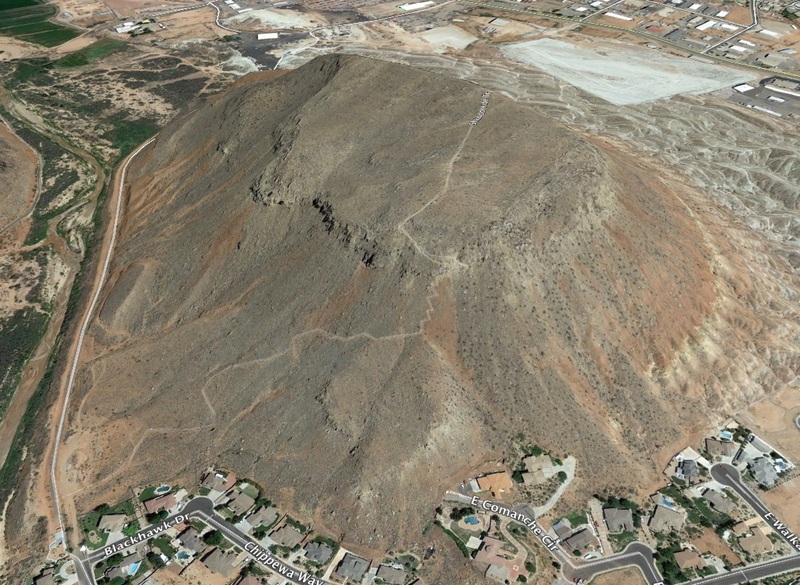 This site tells me that Shinob Kibe is pronounced Shih-NO-bee KY-bee and the mesa is sacred to the Paiute indians. Here's a Google map centered on this arrow. Visiting this arrow requires a short hike up an established trail. This site was known as beacon 37B along the Los Angeles to Salt Lake City route. That route was also known as Contract Air Mail Route 4 and the contract was awarded to Western Air Express. Their first flight on this route was on April 17, 1926. This arrow points to another arrow atop a large slanted uplift region just west of Quail Creek Reservoir.